Fortunately for trans people—though unfortunately for Taylor’s journalistic credibility—it’s not true. The results vary slightly by country and whether the subject is a transgender man or transgender woman (see the graphs below), but for example we see that in the United States, the majority of Americans (38%, the single highest response) would refer to a trans man with a masculine pronoun, while about half that percentage, 21%, would refer to the person using a feminine pronoun. A slightly larger percentage, 23%, said they didn’t know how they would refer to the person, and a minority (18%) said they would refer to the person using a gender-neutral pronoun. It doesn’t clarify whether any misgendering is intentional. It’s a subtle distinction, but the question doesn’t ask people what pronoun they would use when addressing a transgender person, but instead “when speaking about” him or her. 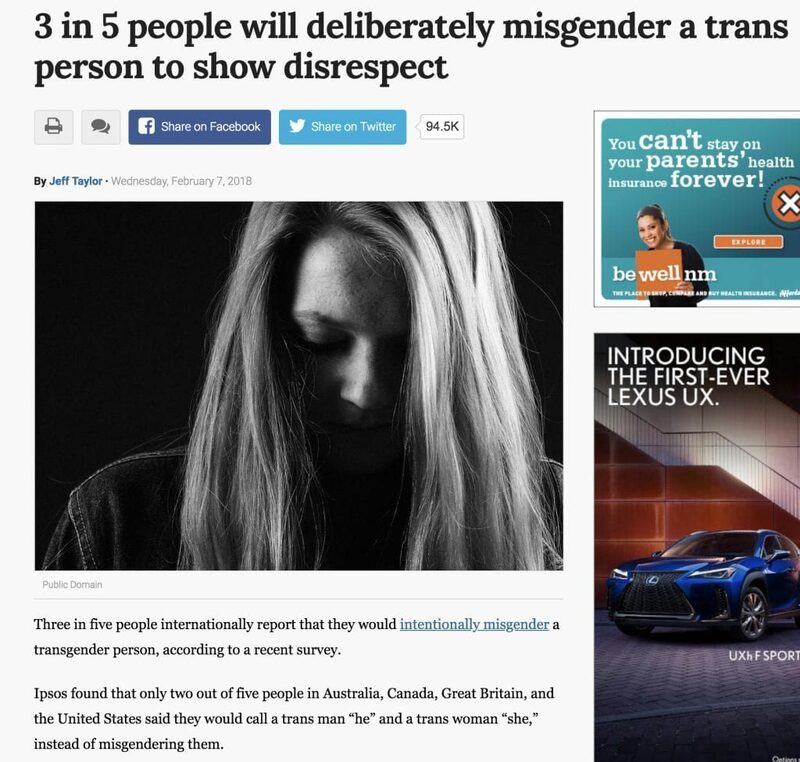 Thus without context we cannot know whether that usage is motivated by intent to show disrespect or simply not knowing what the hypothetical trans person’s preference is. They may misgender people accidentally, or because they are unsure of the person’s preferred address, or out of hostility, or because they simply aren’t aware of the proper etiquette. We cannot assume, as Taylor seems to, that any response other than the pronoun that aligns with how the persons lives and dresses—such as a neutral pronoun or “I don’t know”—necessarily indicates an attempt to deliberately misgender anyone. To do so is misleading at best and fearmongering at worst. For more on this, see my CFI blog HERE.